La Fortuna de San Carlos is known for nature, adventure, wildlife, trails, and parks. Your plan includes some of its best attractions: witness a stunning natural landmark at Tabacon Hot Springs, cool off at Kalambu Hot Springs Water Park, get a new perspective on things with Boat Tours & Water Sports, and hike along La Fortuna Arenal Volcano Rain Forest Reserve. To see traveler tips, other places to visit, reviews, and tourist information, use the La Fortuna de San Carlos trip itinerary maker . Denver, USA to La Fortuna de San Carlos is an approximately 14.5-hour combination of flight and shuttle. You can also do a combination of flight and bus; or drive. Due to the time zone difference, you'll lose 1 hour traveling from Denver to La Fortuna de San Carlos. Wrap up your sightseeing on the 19th (Thu) early enough to travel to Machu Picchu. A symbol of the Incan civilization, the abandoned city of Machu Picchu represents a must-see on a Peru vacation. Start off your visit on the 20th (Fri): take in the awesome beauty at Phutuq K'usi, then look for all kinds of wild species at Los Jardines de Mandor, and then take in the architecture and atmosphere at Igreja Virgen Del Carmen. Here are some ideas for day two: steep yourself in history at Santuario Historico de Machu Picchu and then explore the ancient world of Intipuncu. To see reviews, ratings, traveler tips, and tourist information, you can read our Machu Picchu tour itinerary app . Getting from La Fortuna de San Carlos to Machu Picchu by combination of shuttle, flight, and train takes about 16 hours. Other options: do a combination of car, flight, and train. You'll lose 1 hour traveling from La Fortuna de San Carlos to Machu Picchu due to the time zone difference. 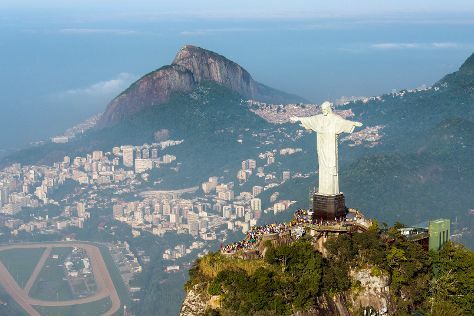 Finish your sightseeing early on the 21st (Sat) to allow enough time to travel to Rio de Janeiro. Rio de Janeiro is known for beaches, parks, museums, nature, and nightlife. Your plan includes some of its best attractions: appreciate the history behind Corcovado Christ the Redeemer, take a peaceful walk through Parque Nacional Tijuca, explore and take pictures at Maracanã, and take in nature's colorful creations at Theatro Municipal do Rio de Janeiro. To find ratings, maps, photos, and tourist information, use the Rio de Janeiro trip itinerary maker . Traveling by combination of train, bus, and flight from Machu Picchu to Rio de Janeiro takes 14.5 hours. Alternatively, you can do a combination of car and flight; or drive. The time zone difference when traveling from Machu Picchu to Rio de Janeiro is 2 hours. In July in Rio de Janeiro, expect temperatures between 78°F during the day and 66°F at night. Wrap up your sightseeing on the 25th (Wed) to allow time to travel to Fernando de Noronha. With 21 lush islands scattered among pristine waters in the Atlantic Ocean, a Fernando de Noronha holiday is well worth the effort it takes to get there. Spend the 28th (Sat) exploring nature at Fernando de Noronha Marine National Park. There's much more to do: enjoy the sand and surf at Baia do Sancho, stroll through Praia do Cacimba do Padre, get outside with Baia dos Porcos, and enjoy breathtaking views from Forte Sao Pedro do Boldro. To find out how to plan a trip to Fernando de Noronha, use our trip itinerary maker. You can fly from Rio de Janeiro to Fernando de Noronha in 8 hours. The time zone difference when traveling from Rio de Janeiro to Fernando de Noronha is 1 hour. 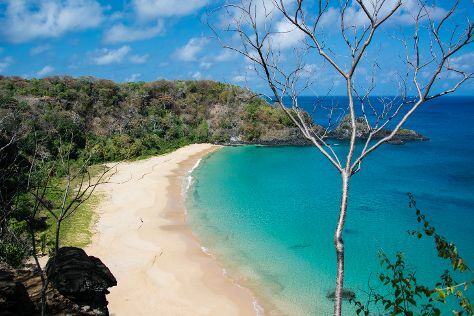 Traveling from Rio de Janeiro in July, expect a bit warmer with lows of 75°F in Fernando de Noronha. Wrap up your sightseeing on the 28th (Sat) to allow time to travel to Sao Paulo. Kick off your visit on the 29th (Sun): admire the masterpieces at Museu de Arte de Sao Paulo Assis Chateaubriand - MASP, then take a stroll through Jardins District, and then stroll through Ibirapuera Park. On the next day, explore the world behind art at Pinacoteca do Estado de Sao Paulo, get into the urban bustle at The Julio Prestes Cultural Center - Sala Sao Paulo, then wander the streets of Paulista Avenue, and finally take in the architecture and atmosphere at Catedral da Se de Sao Paulo. For maps, traveler tips, reviews, and other tourist information, read our Sao Paulo trip maker tool . You can fly from Fernando de Noronha to Sao Paulo in 7 hours. You'll gain 1 hour traveling from Fernando de Noronha to Sao Paulo due to the time zone difference. When traveling from Fernando de Noronha in July, plan for slightly colder days in Sao Paulo, with highs around 72°F, while nights are colder with lows around 55°F. Wrap up your sightseeing on the 30th (Mon) to allow time to travel to Foz do Iguacu. Start off your visit on the 31st (Tue): take in the dramatic scenery at Iguazu Falls. On the 1st (Wed), you'll have a packed day of sightseeing: take in the dramatic scenery at Iguazu Falls. To see where to stay, traveler tips, reviews, and more tourist information, use the Foz do Iguacu journey tool . Traveling by flight from Sao Paulo to Foz do Iguacu takes 3.5 hours. Alternatively, you can do a combination of bus and flight; or drive. In July, daytime highs in Foz do Iguacu are 71°F, while nighttime lows are 53°F. Cap off your sightseeing on the 1st (Wed) early enough to travel to Santiago. Santiago is known for parks, museums, shopping, historic sites, and wineries. Your plan includes some of its best attractions: don't miss a visit to Cerro Santa Lucia, get engrossed in the history at Museo Chileno de Arte Precolombino, see the interesting displays at Centro Cultural Palacio de la Moneda y Plaza de la Ciudadania, and admire the striking features of Metropolitan Cathedral (Catedral Metropolitana). To find ratings, where to stay, traveler tips, and tourist information, refer to the Santiago trip planner . You can do a combination of car and flight from Foz do Iguacu to Santiago in 6.5 hours. Other options are to do a combination of shuttle and flight; or drive. Traveling from Foz do Iguacu to Santiago, you'll gain 1 hour due to the time zone difference. Finish up your sightseeing early on the 4th (Sat) so you can travel to Buenos Aires. Buenos Aires is known for nightlife, historic sites, museums, parks, and shopping. Your plan includes some of its best attractions: admire the natural beauty at Parque 3 de Febrero, admire the architecture and history at Plaza de Mayo, admire the masterpieces at Museo Nacional de Bellas Artes, and admire the landmark architecture of El Ateneo Grand Splendid. To find photos, ratings, other places to visit, and other tourist information, read Buenos Aires tour planner. Getting from Santiago to Buenos Aires by flight takes about 5.5 hours. Other options: drive; or take a bus. The time zone changes from Chile Time to Argentine Time, which is usually a 1 hour difference. In August, plan for daily highs up to 63°F, and evening lows to 51°F. Finish up your sightseeing early on the 7th (Tue) so you can travel to Palm - Eagle Beach. A long stretch of powdery white sand and aquamarine waters, Palm - Eagle Beach remains one of Aruba's most visited vacation spots. Palm - Eagle Beach is known for beaches, casinos, adventure, historic sites, and spas. Your plan includes some of its best attractions: kick back and relax at Eagle Beach, stroll through Palm Beach, enjoy the sea views from California Lighthouse, and look for gifts at Kay's Fine Jewelry. Plan my day in Palm - Eagle Beach using traveler tips and tourist information provided by Inspirock. You can do a combination of flight and car from Buenos Aires to Palm - Eagle Beach in 11.5 hours. You'll gain 1 hour traveling from Buenos Aires to Palm - Eagle Beach due to the time zone difference. Expect much warmer temperatures when traveling from Buenos Aires in August; daily highs in Palm - Eagle Beach reach 92°F and lows reach 81°F. Cap off your sightseeing on the 10th (Fri) early enough to travel to East End. On the 11th (Sat), don't miss a visit to Main Street, meet the residents at Coral World Ocean Park, and then kick back and relax at Trunk Bay. Keep things going the next day: enjoy the sand and surf at Coki Point Beach, then kick back and relax at Magens Bay, and then make a trip to St. Thomas Synagogue. For maps, traveler tips, other places to visit, and tourist information, use the East End trip site . Traveling by combination of car, flight, and ferry from Palm - Eagle Beach to East End takes 8.5 hours. Alternatively, you can do a combination of car and flight. In August in East End, expect temperatures between 89°F during the day and 80°F at night. Cap off your sightseeing on the 12th (Sun) early enough to travel to West Bay. West Bay is known for theme parks, adventure, wildlife, nature, and water activities. Your plan includes some of its best attractions: look for all kinds of wild species at Stingray City, enjoy the sand and surf at Seven Mile Beach, Head underground at Devil's Grotto, and cool off at Cayman Turtle Centre: Island Wildlife Encounter. To find photos, where to stay, traveler tips, and other tourist information, read our West Bay trip itinerary planner . Traveling by combination of car, flight, and bus from East End to West Bay takes 9 hours. Alternatively, you can do a combination of ferry, flight, and bus. The time zone difference moving from Atlantic Standard Time to Eastern Standard Time is minus 1 hour. August in West Bay sees daily highs of 90°F and lows of 80°F at night. Wrap up your sightseeing by early afternoon on the 15th (Wed) to allow enough time to travel back home.